It looks good in theory... can reality match up? On paper Dell's 3706MC looks like it could be one of the more successful PC-to- AV crossover products we've come across. It's got a digital tuner built in, it's HD Ready, it packs an impressive sounding 30W of audio power, and it even sports acclaimed DNX video processing from Pixelworks. In fact, the only potentially worrying news at this 'theoretical' stage is a rather uninspiring 800:1 claimed contrast ratio. 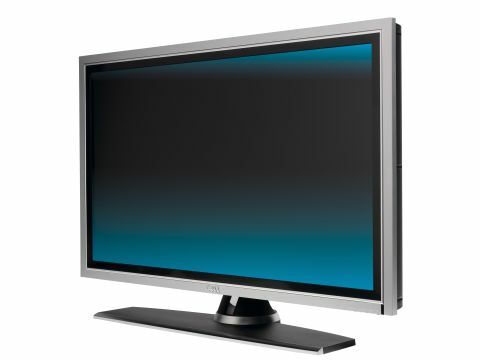 The 3706MC is hardly the best-looking LCD TV thanks to its plastic finish and bland colouring. But its unusually large, detachable speakers certainly look promising on the power front. Connectivity, meanwhile, shows plenty of AV ambition. There are two digital video inputs - HDMI and DVI - plus a component jack, two Scarts, a CAM slot for adding subscription digital TV services, and a subwoofer output should those speakers not prove so powerful after all. So far, so good. But there are operational niggles: the seven-day electronic guide supporting the digital tuner only shows information on the channel you're currently watching, and presents its information with text so small you'll need binoculars to read it; and the DVI refused to accept an upscaled HD feed from our resident Marantz DV9600 DVD deck. Sadly there are also some major performance issues to report. Even with our high definition Face/Off feed the picture looks strangely soft, with the usually very sharp scenes, like those in Archer's office, looking low on detail. It doesn't help with a film as kinetic as Face/Off that this Dell is comfortably one of the poorest handlers we've seen, making some of the film's frantic gunplay look blurry and indistinct. More trouble comes with the 3706MC's colour response. Scenes like the opener on the carousel look slightly dull thanks to a flat white balance, while supposedly colour-rich scenes like the shoot-out at the funeral look muted. As if this wasn't enough, the colour tone isn't particularly natural either. And still there's more disappointment, as black levels bottom out into grey much sooner than with any other model we've featured, leaving the dark prison scenes feeling flat and lifeless. The Dell 3706MC does at least show Face/Off without much video noise, and, thanks to the DNX processing, has no jaggedness around edges. Plus it does a fair job of upscaling standard definition to fit its native resolution (though motion smearing with standard definition is even worse). Its big speakers, meanwhile, rock, pumping out the gloriously OTT sound mix with terrific power, dynamic range and clarity. But top sound doesn't make a great TV. Sadly this Dell is too lacking in the picture department to be seriously worth considering - even given its cheap price tag.